Papilledema or papilloedema is optic disc swelling that is caused by increased intracranial pressure due to any cause. The swelling is usually bilateral and can occur over a period of hours to weeks. Unilateral presentation is extremely rare. In intracranial hypertension, the optic disc swelling most commonly occurs bilaterally. When papilledema is found on fundoscopy, further evaluation is warranted because vision loss can result if the underlying condition is not treated. Further evaluation with a CT or MRI of the brain and/or spine is usually performed. Recent research has shown that point-of-care ultrasound can be used to measure optic nerve sheath diameter for detection of increased intracranial pressure and shows good diagnostic test accuracy compared to CT. Thus, if there is a question of papilledema on fundoscopic examination or if the optic disc cannot be adequately visualized, ultrasound can be used to rapidly assess for increased intracranial pressure and help direct further evaluation and intervention. 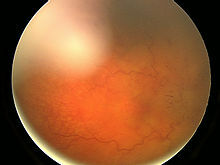 Unilateral papilledema can suggest a disease in the eye itself, such as an optic nerve glioma. Fundal photograph showing severe papilloedema in the right eye. In the early stages, papilledema may be asymptomatic or present with a headache. It can progress to enlargement of the blind spot, blurring of vision, visual obscurations (inability to see in a particular part of the visual field for a period of time). Ultimately, total loss of vision can occur. Isotretinoin, which is a powerful derivative of vitamin A, rarely causes papilledema. CPAP therapy for sleep apnea: Those with sleep apnea on continuous positive airway pressure therapy had a 105% increased hazard of experiencing papilledema (adjusted HR=2.05 [CI=1.19-3.56])[further explanation needed] relative to individuals without sleep apnea. It is important to determine whether the observed condition is due to optic nerve head drusen, which can cause an elevation of the optic nerve head that can be mistaken for papilledema. 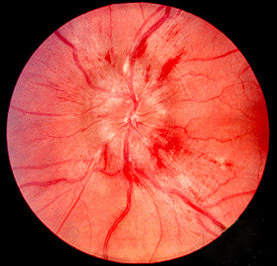 For this reason, optic nerve head drusen is also called pseudopapilledema. Historically, papilledema was a potential contraindication to lumbar puncture, as it indicates a risk for tentorial herniation and subsequent death via cerebral herniation, however newer imaging techniques have been more useful at determining when and when not to conduct a lumbar puncture. Imaging by CT or MRI is usually performed to elicit whether there is a structural cause i.e., tumor. An MRA and MRV may also be ordered to rule out the possibility of stenosis or thrombosis of the arterial or venous systems. Meanwhile, steroids can reduce inflammation (if this is a contributing factor to increased ICP), and may help to prevent vision loss. However, steroids have also been known to cause increased ICP, especially with a change in dosage. However, if a severe inflammatory condition exists, such as multiple sclerosis, steroids with anti-inflammatory effects such as Methylprednisolone and prednisone can help. Other treatments include repeated lumbar punctures to remove excess spinal fluid in the cranium. The removal of potentially causative medicines including tetracyclines and vitamin A analogues may help decrease ICP; however, this is only necessary if the medication is truly felt to contribute to the ICP increase. ^ K., Khurana, A. (2015). Comprehensive ophthalmology. Khurana, Aruj K., Khurana, Bhawna. (6th ed.). New Delhi: Jaypee, The Health Sciences Publisher. ISBN 9789351526575. OCLC 921241041. ^ Ohle, Robert; McIsaac, Sarah M.; Woo, Michael Y.; Perry, Jeffrey J. (2015-07-01). "Sonography of the Optic Nerve Sheath Diameter for Detection of Raised Intracranial Pressure Compared to Computed Tomography A Systematic Review and Meta-analysis". Journal of Ultrasound in Medicine. 34 (7): 1285–1294. doi:10.7863/ultra.34.7.1285. ISSN 0278-4297. PMID 26112632. ^ Cameron AJ (1933). "Marked papilloedema in pulmonary emphysema". Br J Ophthalmol. 17 (3): 167–9. doi:10.1136/bjo.17.3.167. PMC 511527. PMID 18169104. ^ Rich Phillips (2012-02-10). "Astronaut feels space's toll on his body". CNN. Retrieved 2012-03-01. ^ Stein JD, Kim DS, Mundy KM, Talwar N, Nan B, Chervin RD, Musch DC (2011). "The association between glaucomatous and other causes of optic neuropathy and sleep apnea". Am. J. Ophthalmol. 152: 989–998.e3. doi:10.1016/j.ajo.2011.04.030. PMC 3223261. PMID 21851924. ^ Gower DJ, Baker AL, Bell WO, Ball MR (1987). "Papilledema and lumbar puncture risk". J. Neurol. Neurosurg. Psychiatry. 50: 1071–4. doi:10.1136/jnnp.50.8.1071. PMC 1032242. PMID 3655817.